The new Irish coin designs, first minted in 1928 attracted a lot of media attention at home. This is well documented and most Irish coin collectors have read the various contemporary and more recent articles on this topic. What is less well known is how we influenced coin design abroad. 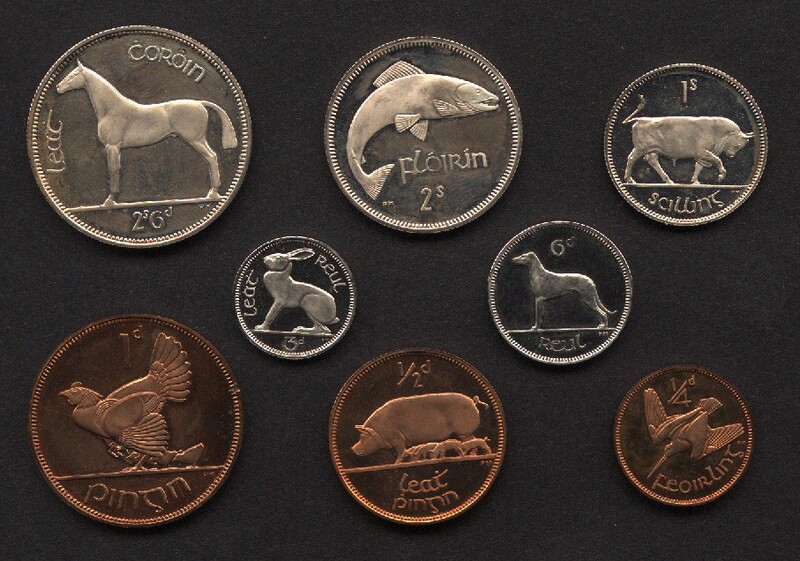 The 1928 Irish coin set, designed by Percy Metcalfe, featuring the farthing, halfpenny, penny, threepence, sixpence, shilling, florin and halfcrown designs for the new coinage of the Irish Free State. The much deserved winner of the Irish coin design competition was Percy Metcalfe and he went on to become an international coin designer of some merit. He re-designed several elements of the British coinage – albeit via subtle changes in line with the very conservative approach by the Royal Mint. As with most successful design competition winners, he adhered to the guidelines set out by the competition tender. The Irish guidelines were very cleverly written, since they wished avoid religious issues and potential contemporary political divides, while essentially showcasing national symbols – a very tricky brief indeed. 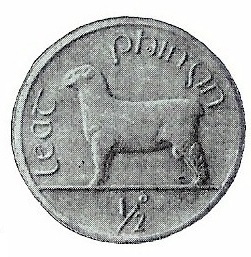 A less well known Percy Metcalfe design for the 1927 competition was the ‘ram’ pattern, halfpenny (from a plaster model). This was the alternative to the highly controversial ‘pig’ design. The committee settled on a theme featuring Irish animals – which successfully avoided religion and politics – amid a storm of protest from those on the extremities of Irish religion and politics. That aside, another debate was raging outside of Ireland within the British Commonwealth of Nations, i.e. how to express their national identity without irritating their colonial masters. The results were quickly seen in the new coinages of Southern Rhodesia (1932), New Zealand (1933) and both Fiji and Mauritius in 1934. All of these countries issued coins featuring native animals, boats and implements. 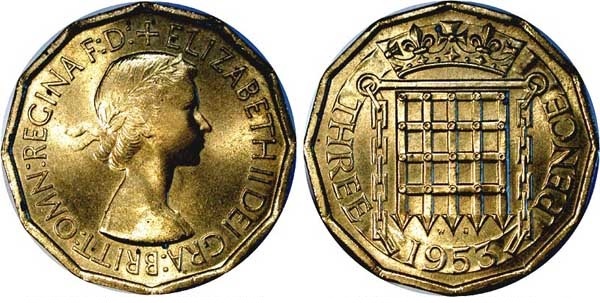 His comments might not have been welcomed by his peers at the time but, in 1937, Britain began to phase out the small silver threepence (with its typical heraldic devices) with the beautiful ‘sea thrift’ design of the new brass threepence. Initially, this floral design was to feature on an Edward VIII coin but, due his sudden abdication in favour of his brother, it first circulated as a George VI coin. Percy Metcalfe was one of two artists that were invited to Sandringham to sketch George VI for the new threepence obverse design. It was a very hurried process but the Royal Mint managed to issue the new coins in time for the coronation which was already planned, but amended by simply substituting George for Edward at the ceremony in Westminster. This design was replaced by a return to heraldic themes by his daughter (Queen Elizabeth II) with the ‘seal of the House of Commons’ reverse design for her brass threepence in 1953. Prior to the Irish Free State’s coinage of 1928, all British colonial and British Commonwealth coinage featured British designs aimed at maintaining the British colonial mindset. Of course, many of the coins were produced by The Royal Mint in London and many of these coins were designed by British artists – so it could be expected that they would exert some influence. Those colonies that did not yet have coinage of their own simply used British coins, and/or British colonial coinage – most of which were in the same imperial fractional denominations and shared common metallic composition, weights and dimensions. The Irish Free State coinage also followed the British Imperial fractional system, with similar metal compositions, dimensions and weights – albeit with a few significant changes. Following the secession of most of Ireland from the United Kingdom in 1922, the then created Irish Free State remained (for the purposes of British law) a dominion of the British Empire and thus its people remained British subjects with the right to live and work in the United Kingdom and elsewhere in the Empire. In 1937 a new constitution was drawn up and the Irish Free State was no more – from then onwards our coins showed the legend “Eire” and we were a de facto republic. This uneasy status quo remained, with Ireland participating little in the British Commonwealth and Éamon de Valera remarking in 1945 that “we are a republic” in reply to the question if he planned to declare Ireland as a republic. Then somewhat unexpectedly in 1948, during a visit to Canada, Taoiseach John A. Costello announced that Ireland was to be declared a republic. The subsequent Irish legislation, the Republic of Ireland Act 1948, provided for the abolition of the last remaining functions of the King in relation to Ireland and provided that the President of Ireland may instead exercise these functions in the King’s place. When the Act came into force on 18 April 1949, it effectively ended Ireland’s status as a British dominion. As a consequence of this, it also had the effect of ending Ireland’s membership of the British Commonwealth of Nations. Since these four countries adapted Ireland’s ‘animal’ set of 1928 for some of their own during the 1930’s, many other countries have adopted ‘animal’ themes, including Australia, Croatia, Greenland, Iceland, Indonesia, Philippines and Zambia but to name a few. These beautiful Australian coin designs feature the kangaroo, emu, duck-billed platypus and lyre bird, respectively. This 2010 Greenland coin set features many native animals from beyond the frozen lands of the Arctic Circle. Iceland is another European country that is clearly proud of their native flora and fauna, as shown on this coin set – the 100 Kronur pictures a Lumpfish. A Shore Crab is on the 50 Kronur. The 10 Korunur depicts four Capelins. A pair of dolphins is on the 5 Kronur. The obverses of these four depict the four guardian spirits of Iceland, known as landvaettir or land wights. They are the eagle, dragon, rock giant and the bull. The spirits date from Viking times. According to legend they protected Iceland when Danish king Harald Bluetooth attempted to invade Iceland.